Kelly Robinson is a new artist of mixed Nuxalk and Nu-chu-nualth ancestry. 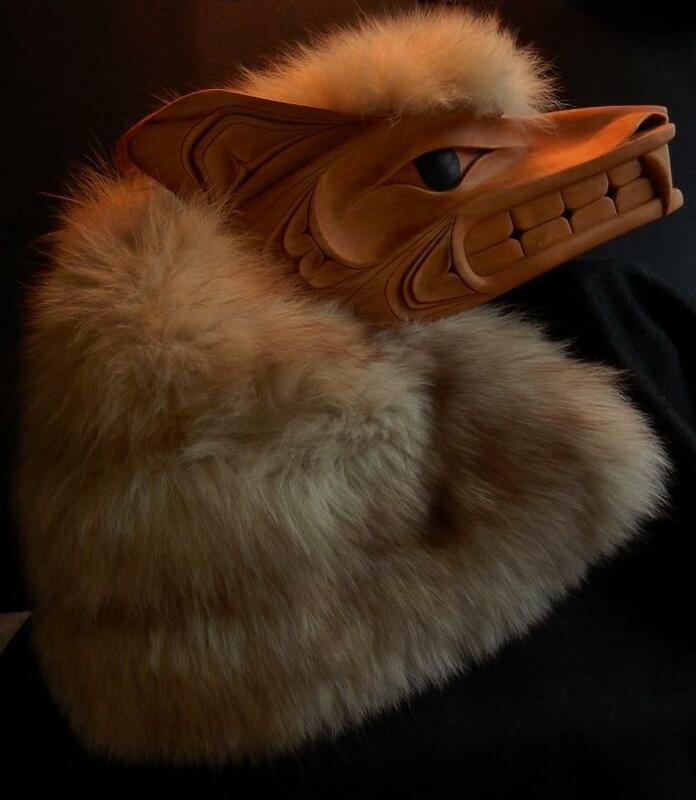 His silver jewelry is starting to become a regular feature of Vancouver galleries, and in the last year he has begun carving masks in both his traditions. However, he tells me that his first medium was painting, and, to judge from “Mother of Mischief,” it remains one that he is deeply interested in developing. “Mother of Mischief” is done in the Nuxalk style, and is the first art in that tradition that I have bought. Geographically located between the northern nations such as the Haida and the Tsimshian and the central Kwakwaka’wakw, the Nuxalk culture has been comparatively overlooked and has had little written about it – so much so that an artist of another nation spent most of an afternoon trying to figure out how to carve the eyes of a Nuxalk mask with Robinson. However, from what I have been able to learn from first and second hand sources, the Nuxalk tradition might be called loosely-rendered formline. By that I mean that it shares many of the individual elements of the northern formline, such as the ovoids and U shapes, but follows more informal rules about their positioning. 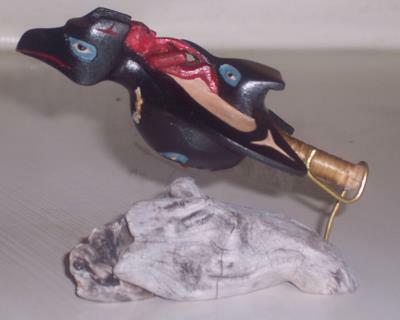 Nor, on the whole, are Nuxalk designs as intricate as any of those in the northern tradition. Instead, Nuxalk designs have a bold simplicity that give them a strong visual appeal, especially when shown at large sizes. 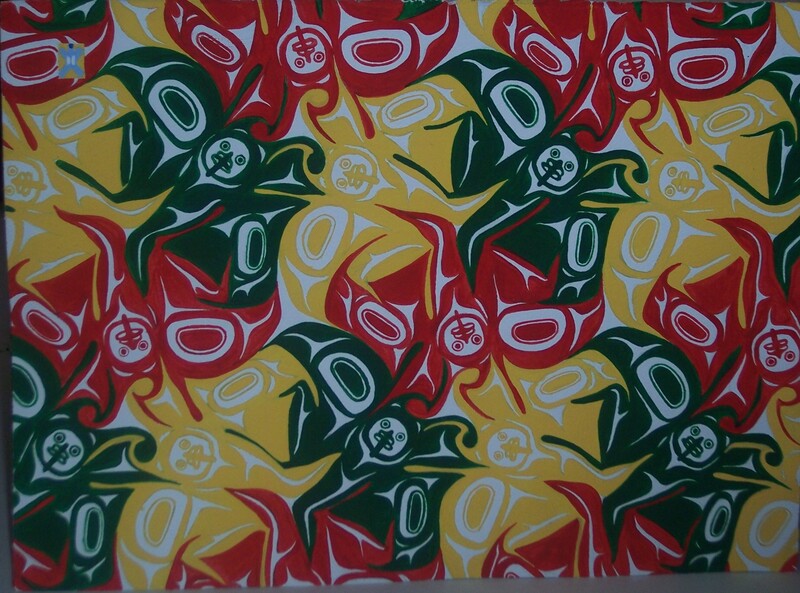 Another characteristic of Nuxalk art appears to be a wider variation of colors than in the northern formline traditions. 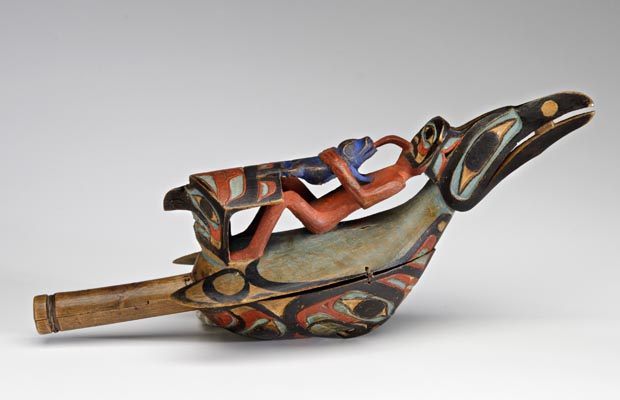 While northern formline favors black for the primary formline and red for the secondary, only occasionally reversing the color scheme or adding a third color, the Nuxalk palette seems broader, with greater use of blue and green, as in Kwakwaka’wakw work. From this brief description, you can see why “Mother of Mischief” seems to me to be rooted firmly in the Nuxalk tradition. 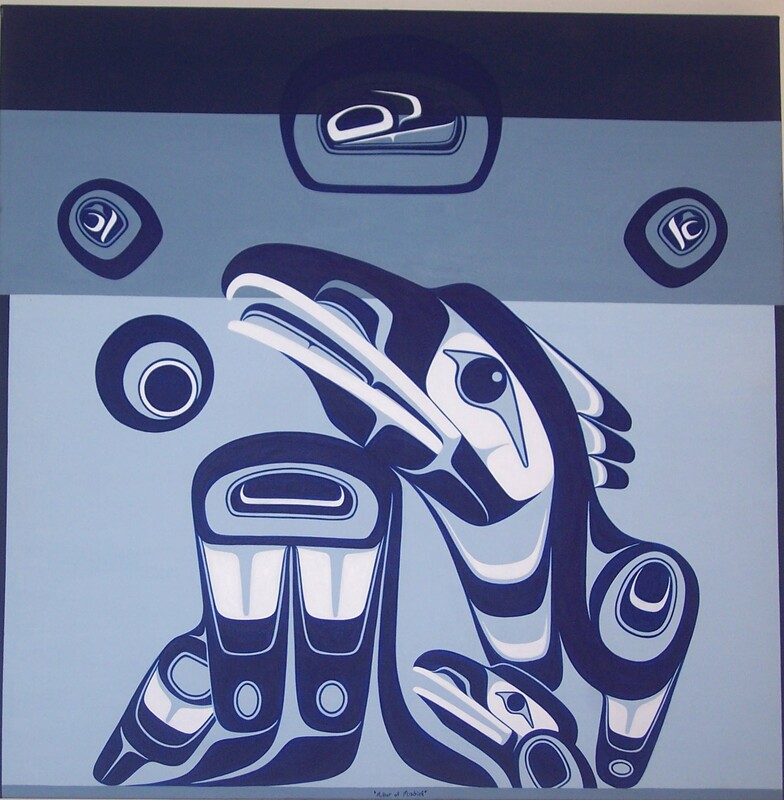 Centering on a Raven hen and her offspring ,at three feet by three feet, the painting has all the boldness of the best Nuxalk work, with three realms of existence – the land, water, and sky – depicted by rectangles of different blues. Once you see realize the organization, the picture falls into place, with the middle blue strip representing the water where the salmon swim and the sun positioned both in the sky and, because of its reflection, in the water as well. On the land is a salmon or salmon roe that that the mother has found (for, contrary to common belief, ravens are not just scavengers; they can fish and hunt as well as other birds, but often carrion makes for an easier meal). At the same time, the painting has a surprisingly modern feel to it. Parts, such as the ovoid at the top of the mother’s wing resembles the simple outlines of a sports logo, in particular, the old hockey stick logo of the Vancouver Canucks, a team that I happen to know that Robinson follows. 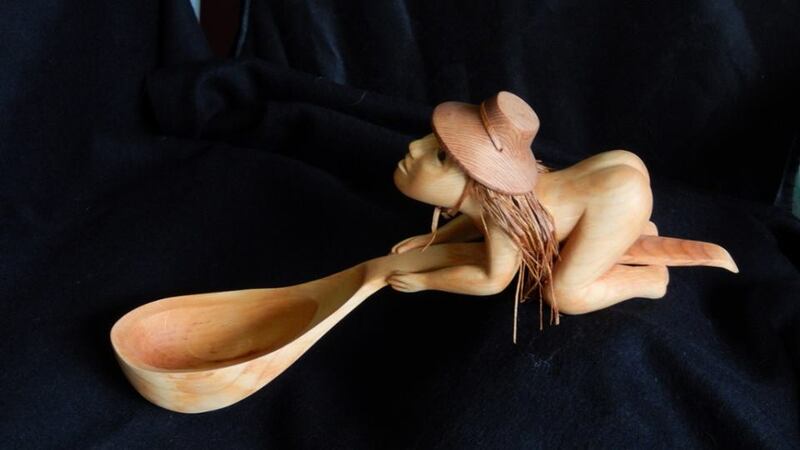 Other parts of the design, such as the bent wing tips and the reduction of the mother’s body to a single tapering line, are reminiscent of late period Bill Reid. 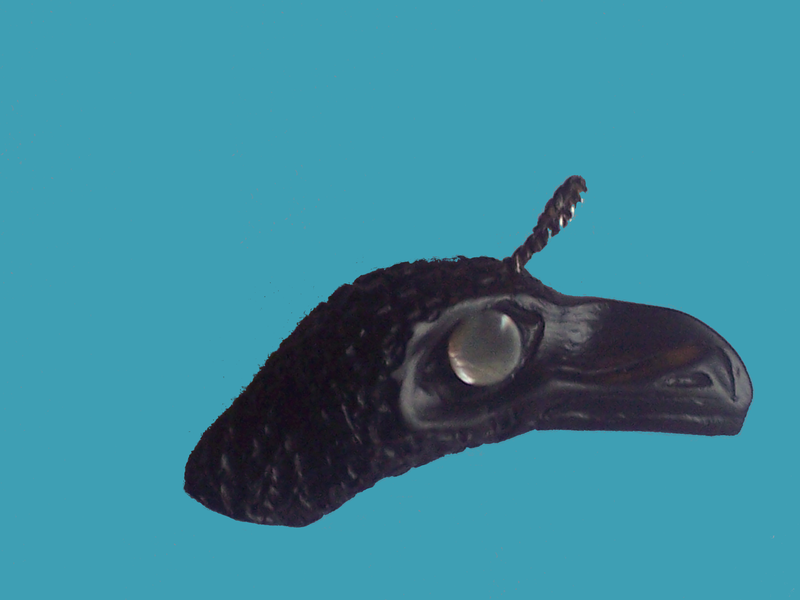 Nor, do I think that a traditional design would be so strongly asymmetrical, or depict the raven fledgling as mirroring the mother’s positioning and design, with minor differences. Maybe you would have to be familiar with birds to notice, but, to me, the fledgling’s bare beginnings of a curved beak suggests immaturity. Similarly, the lack of an oval in the eye or a visible tongue between the upper and lower beak suggests that the fledgling doesn’t share the mother’s watchfulness. Instead, it seems to be looking fixedly at the salmon on the shore, ready to waddle after it without worrying about the possibility of danger. Robinson may be a newcomer, but”Mother of Mischief”shows that he is already an artist to reckon with. I’ve hung it over the largest couch in the living room, and, sooner or later, I expect it to be joined by either another of Robinson’s paintings, or perhaps one of his masks.